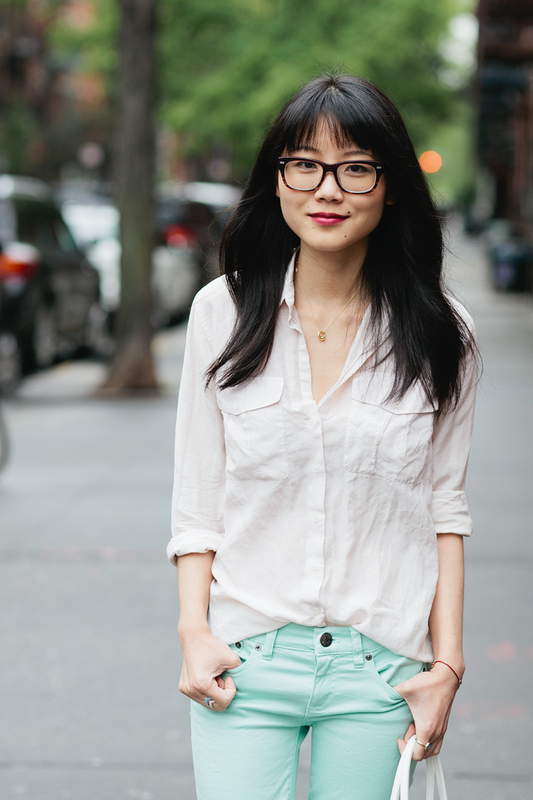 I didn't think I'd be jumping on the colored denim trend, but I could not resist these happy mint colored jeans from J.Crew. They inspired me to do a mini pastel-y style post. Although these are "ankle" jeans, they fit my petite self like normal pants (with some scrunching at the bottom no less!). I am quite tempted to try some of the other colors - particularly "neon persimmon." I wear a lot of neutrals most days but colorful pants are just kinda fun. My hair is out of control. And you can probably tell my bangs were a DIY hack job hah. I agree w/Ranu-your bangs look great and you're so beautiful! And wow, I want to try out these JCrew jeans, they look incredible (and such a fun color)! i love this color combo on you. gorgeous. i do my own bangs as well and i don't mind if they look a little choppy :) such a comfy and easy look. i've been warming up to colored jeans as well and it's pretty great. oh my word you are beautiful! you own those jeans!! love. Dear, me. You look fantabulously beautiful! And your hair is not a mess, do not fret. I'm in love with those jeans as well...I love the simplicity of your blouse paired with it. I stumbled upon your blog while searching for some other bloggers and I'm quite glad I did! you look fabulous in those mint jeans! i still have yet to get myself a pair, not that i dont love them. You are all kinds of gorgeous! I cut my own bangs almost exclusively, with varying results (usually bad). Hehe! 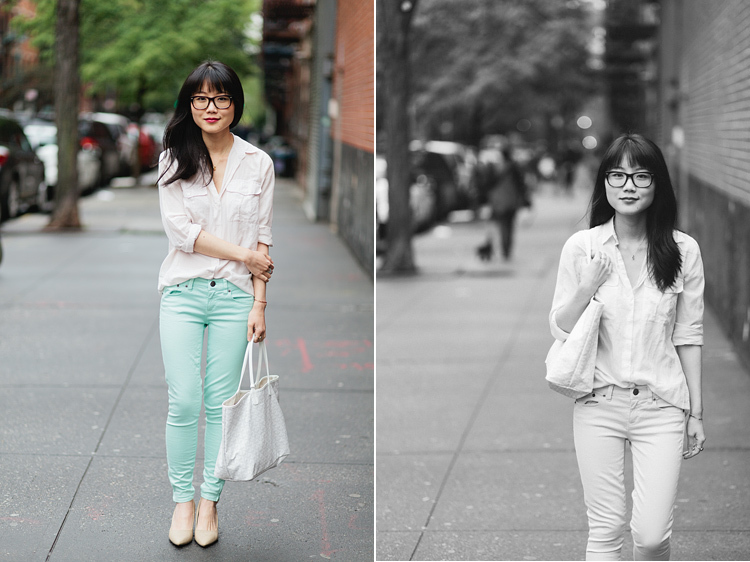 I really love these mint jeans! Never considered wearing colorful jeans, but I just might because you pull it off so beautifully. Couldn't tell at all your bangs were DIY! You did a great job! Love your shirt & lip colour! I adore your style and those mint green skinnies look KILLER on you. On a side note, am currently planning a Dec trip to NYC with friends. Am using your blog to populate my 'to do/see/eat' list, hehe. Hopefully will finally get to meet you in person. Ooh they look gorgeous. I think the bright lipstick is just the cherry on top. alice, you are stunning. love this outfit so much and your hair (especially your bangs!) is beautiful. this mint pants suit you a lot!! please wear it more often! Mint looks amazing on you! Your bang "hack job" is much better than what I did to mine, that's for sure, haha. My kind of style! I'm still impatiently waiting for J Crew to open here in the UK. This is a simple outfit but so very classy. You are crazy hard on yourself. All I could think was "Man, her hair looks AMAZING."